A more recent study was published in Science just a few weeks ago and NPR’s All Things Considered covered it in a podcast/article called, Gut microbes may play deadly role in malnutrition. Click below to listen to the four minute story. It seems we still have a lot to learn about malnutrition in developing nations, and merely providing supplemental foods may not be enough to stem the issue. Can science and engineering help solve world hunger? “One way to solve world hunger would be to develop new ways to grow food on a worldwide scale. Many people today live in areas of the world which were never capable of producing sufficient food crops or are nearly impossible to irrigate. Some arable land remains underused because it is under the control of rogue governments or is currently too inaccessible for farming. By developing new methods for maximizing crop growth on substandard land, inhabitants can grow enough food to meet their needs. “Genetically modified rice could be a good source of vitamin A for children in countries where deficiency in the vitamin is common. 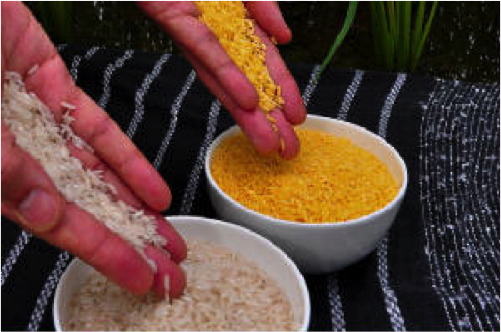 A new study tested so-called Golden Rice against both spinach and supplements in providing vitamin A to 68 six- to eight-year-olds in China. Researchers found that the rice was as effective as the capsules in giving kids a boost of vitamin A, based on blood tests taken over three weeks. And it worked better than the natural beta-carotene in spinach, the researchers report in the American Journal of Clinical Nutrition.” Read more HERE. With the tools of biotechnology, we can grow more crops on less land, grow new, more nutritious crops, and find new uses for existing crops.